So a little while ago an e-mail was sent around at work to try out this online paper airplane game. The game is located at: http://flightsimx.cyclops.amnesia.com.au/index.html. The current record in the office was 91m. After about 10 minutes I was able to beat that record with 101.167m. After this I really wanted to beat my own score. I developed a stratagy to use the touchpad on my laptop at the very top edge to have a consistent mouse sweep. But even after doing this for a while I couldn’t achive consistent results. That’s when the thought came to me about writing a program that will do the same mouse sweep each time. Then all I would need to do it tweak the settings to achieve the perfect mouse sweep. I ended up developing a little .NET 2.0 windows app to do the perfect sweep. In my program you use the x and y coordinates in the middle of the program to determine where you mouse is. You move your mouse over your start position and record those coords in the Start X and Start Y. Do the same for the ending position. The speed is the number of milliseconds it takes for the sweep to get from start to end. So the lower the number the faster the sweep. You can use the grab x and y and the play again x and y for those actions. Once you have all of your coordinates entered. 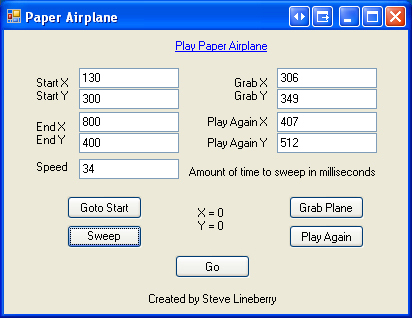 You can just hit Go and it will automatically click play again, click (grab) the paper airplane, move the plane to it’s start position, and then sweep the mouse to toss the airplane. Each of these actions can be performed by them selves by using the appropriate button on the app. When you close the program it will record your settings in the registry so the next time you run the program your settings will be remembered. Also, you can use the link at the top of the program to launch the website for the game. After being proud of myself in building this app I was still having trouble with the plane being thrown consistent. I was able to figure out that the Paper Airplane game is really a scam. I believe it randomizes the throws so even if you do the exact same throw each time, only a few times will you actually get a good throw. Try it out for yourself and you’ll see what I mean.